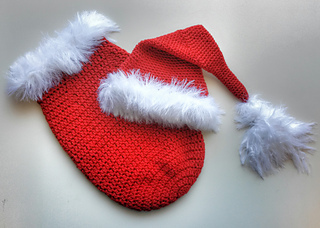 This adorable Cocoon and Santa Hat are perfect for your newborn’s photo shoot this holiday season! Shimmer yarn and silky soft eyelash yarn combine for this festive ensemble, making it the perfect photo prop for your Christmas baby. Cocoon and hat each measure 14 inches long. Cocoon and hat openings are both 7 inches wide. Fits newborns to at least 10 pounds.